A recent Elemental customer survey bears this out with 74% of respondents who represented a broad cross-section of broadcasters, pay TV operators, sports programmers and over-the-top service providers -- reporting that they are likely or very likely to adopt 4K technology by 2016. 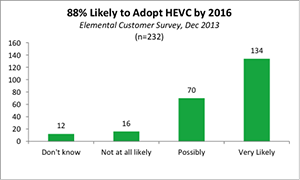 In the same survey, 88% of respondents said they were likely to adopt HEVC. As 4K content, services, chips and STBs become more available and consumer demand ramps, content creators are beginning to future proof productions for higher-resolution formats. Given the more flexible time constraints for on-demand video, online streaming services will likely be the first to offer 4K UHD TV content. Netflix and Amazon have both announced original series shot in 4K and at CES 2014, even GoPro featured 4K content (much of which was encoded with Elemental video processing software). When consumers are able to produce stunning content like this from a camera mounted on their head or bike or skateboard, there clearly is a bit of momentum in play. 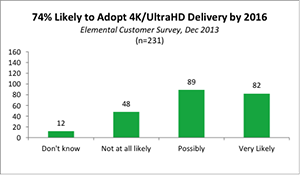 In the shorter term, 2014 will be known as the Year of 4K and Ultra HD Trials. Broadcasters, sports programmers and pay TV operators are now in intensive investigation mode, testing acquisition, production, and delivery workflows. Weve seen that over the past few months with high-profile live sports events such as the Super Bowl in the U.S. (CBS) and the Sochi 2014 Olympics (Comcast NBC and multiple Russian state broadcasters, including Channel One and NTV-PLUS). In terms of 8K, while Japanese national broadcaster NHK has set a 2020 date to begin satellite broadcasts of 8K content in alignment with the Olympics taking place in the country that year, theres some doubt about its in-home applicability. With any major technology advancement, there are equally significant challenges. In terms of 4K and UHD, the most significant of these may well be streaming higher-resolution content. Ironically, it also may be the area in which weve seen the most progress in terms of technology advances and key milestones achieved. To start, bandwidth required to delivery UHD is significant, and there are only two fundamental ways to cope with this: have more bandwidth or reduce bandwidth required. The HEVC compression codec is a key enabler for 4K services. With four times the resolution of high-definition (HD), 4K content will require significant upgrades to current MPEG-2 and advanced video coding (AVC/H.264) infrastructures. The bandwidth required for H.264 compressed 4K content (35+ Mbps) is prohibitive. Designed to deliver an average bit rate reduction of up to 50% compared to H.264, HEVC shrinks bitrates required for 4K to potentially less than 10 Mbps. However available bandwidth, particularly with streamed content, varies greatly. It differs by operators, devices, regions, countries and even on a neighborhood-by-neighborhood basis. For live streamed services, the bandwidth must be available to deliver a high-quality experience, but in the majority of homes globally today this isnt the case. Over time, however, these pockets of variability will even out and streaming services will be able to deliver experiences on par with traditional modes of video delivery for UHD. Multichannel UHD storage is another issue. The storage required for UHD content is enormous, even in the compressed domain. It essentially requires 4X to 6X the amount of storage for a given asset. It also can make intra-production transfer more challenging. While HEVC helps reduce the storage and transfer bottlenecks, migrating to UHD-capable infrastructure is a must. Finally, were now operating in an environment where there are no longer generations of encoders. The Elemental software-defined video processing platform enables constant improvement in algorithms for customers with a simple seamless upgrade. For example, our H.265/HEVC compression has improved by more than 25% in the past year alone and all through software refinement. For UHD, we see a wide range of bit rates by low teens for easy content such as pre-produced VOD programming and high teens to low twenties for hard content such as live sports or other events as a rough guideline. Huge steps forward toward more pervasive 4K were taken over the past six months, spearheaded by Elemental and key strategic technology and content programmer partners. These included the first demonstration of real-time 4Kp30 HEVC video processing at the Osaka Marathon, and real-time 4Kp60 HEVC video processing at a special event in London. Leaders have taken note of Elementals successful delivery of multiple unprecedented 4K high-efficiency video coding (HEVC/H.265) advances and the agility of its entirely software-based, format-agnostic video processing approach. Consequently, as CES this year companies such as Akamai, Broadcom, Qualcomm, and ST Microelectronics, among others, tapped into Elemental video processing to power their 4K demonstrations. Show floor highlights included streaming of 4K HEVC and MPEG-DASH video to tablets and set-top boxes with Akamai, compatibility with STMicroelectronics and Broadcom hardware chipsets, and real-time encoding of MPEG-DASH-compatible DivX Live for HEVC-based content streamed to an Android tablet. Software-defined Video Processing Vital as the 4K Stakes Get Higher Both the premium quality of UHD content and end-user enhancements designed to expand revenue opportunities heighten security concerns. Intelligent Elemental software-defined video processing platforms naturally evolve, seamlessly upgrading apace with the industry and capable of handling multiple generations of security requirements. Companies like Adobe, Apple, Microsoft and others and view software-based solutions from companies like Elemental as vital to heightened content protection requirements as the stakes get higher and higher. While the cost of 4K equipment is incrementally higher than traditional HD gear at present, these costs will go down when 4K goes mainstream. Moreover, software-based 4K/HEVC solutions, such as Elementals, will offer multiple cost-saving opportunities as content programmers and distributors transition their MPEG-2 and H.264-based facilities to support 4K and UHD streaming. The immersive nature of the 4K Ultra HD streamed viewing experience holds broad appeal and the industry is poised to make even the most compelling devices affordable to consumers. We believe 4K streaming is one of the multiple consumer trends that will emerge over the next five years. But the bottom line for Elemental is that even if 4K doesnt happen, all the investments that Elemental customers make in our solution would be completely reusable for other applications. This is the power of Elemental software-defined video processing platform. Change happens, and we have the flexibility to adjust.